Meyer's research group has selected the widespread pathogen Chlamydia trachomatis for their study, which often does not cause any symptoms when sexually transmitted and therefore goes unnoticed. This favours the development of chronic infections, which in women sometimes ascend into the fallopian tubes and are associated with infertility, ectopic pregnancy and ovarian cancer. Because Chlamydia infections are extremely common—more than 100 million new infections per year are estimated worldwide—such serious consequences are a cause for concern. Up to now, scientists have barely been able to investigate the consequences of an infection because fallopian tubes are very difficult to access for clinical investigations. In addition, for a long time there was no model system in which they could analyse the natural course of an infection. "In the past, we were dependent on HeLa cells—a human cell line cultivated from cervical cancer—for infection experiments with Chlamydia. However, these experiments lasted a maximum of 72 hours, after which all cells died," explains Mirjana Kessler, head of the study. 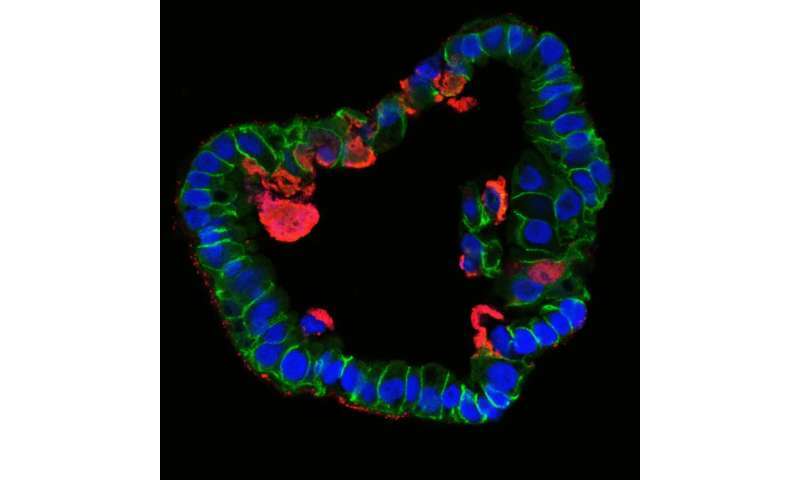 "However, when we first looked at time-lapse images of infected fallopian organoids, the difference was astonishing." The organoids stay alive for weeks and months, while the bacteria infect cells and create new offspring, which in turn infect new cells. The team suspects that the difference is mainly due to the fact that organoids resemble the natural structure of the epithelium: Their cells are not flat like cancer cells, but tightly packed together and three-dimensional, with a distinct inner and outer surface. This enables them to fend off infections more effectively. Only a subset of cells is infected and subsequently pushed out of the epithelium by the surrounding cells, thus preventing tissue damage. "The cells and bacteria achieve a kind of equilibrium that is very similar to a real human infection. This allows infected organoids to survive for months," adds Thomas Meyer. "This is the first time we have succeeded in reproducing the course of a chronic bacterial infection in mucosal cells."